Click the button to download file picnews.zip. Fast! Multithreaded concurrent retrieval of group lists and news from multiple news groups. Automatic assembly out of order multi-part messages and intelligent decoding. Detect cross post into multiple groups and improve performance. Allow you to set a exclude pattern to skip messages that you don't like. Handle UUENCODE, Quoted Printable, MD5, Base64 and MIME encoding, also does multiple MIME decoding. Easy file management allows you to delete unwanted files. Manual decoding features gives access of the powerful decoding engine. 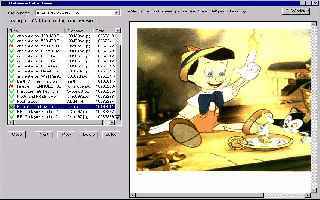 Index the retrieved JPEG/GIF images, AVI/MPG video clips and other data files in HTML format, so you can view them right in your WEB browser. Install the program by running the SETUP utility. The user interface of Pictures In News has two list windows, the one on the left shows available news groups, the one on the right shows the selected groups which you want to retrieve news from. To subscribe to your favorite groups, choose News Groups -> Add Group menu and enter the group name. To fetch all available groups from your NNTP server, choose News Groups->Show All Groups, since there are a great number of groups, this may take quite a while, since the program is multithreaded, you don't need to wait till this process to finish before you start reading news. You may stop the retrieval of the news groups using News Groups->Stop menu or simply click on the News Groups column header. You can use the News Groups->Search Groups to find the groups that match a pattern, which can be a generic regular expression (if you don't know anything about regular expressions, just enter a single keyword such as picture). To select a group for news retrieval, double click a group on the left-hand side, or select one or more groups on the left and then press the Select button. To start retrieval of news, press the Fetch Pictures! button, to stop the retrieval, press the same button again. To monitor the progress and statistics, press the Monitor button. To view the pictures and other files retrieved for a group, select it on the right-hand side and press the View Pictures button , it will launch your default browser to view the files. You can also double click the group to bring up a file management window. To manual decode a set of message files, choose File->manual decode menu item. You can simply add a set of files to be decoded, each file should contain a single news record (or email record). Press the Decode files button, and Pictures In News will decode any binary attchments in it, even if they are spread out in multiple files. Before you use the program, you need to first provide the NNTP server name. NNTP is a standard internet protocol for distributing Usenet News. get the NNTP server address. there are public servers that are accessible to anyone. However, they may not have all the groups. there has over 30,000 groups, you may check them out. image files(make sure it has enough free space).